The play area at Farnsworth Elementary School on Chicago’s northwest side is mostly asphalt. There’s a small grassy area, but it’s largely covered in weeds, and floods after heavy rains. The playground equipment is missing pieces, and the rubber mat covering the ground has large gaps. It’s not a great place for children to play, says Principal Barbara Oken. But that’s all about to change. Farnsworth is one of six Chicago Public Schools (CPS) set to receive a $1.5 million transformation as part of the Space to Grow program in 2018. 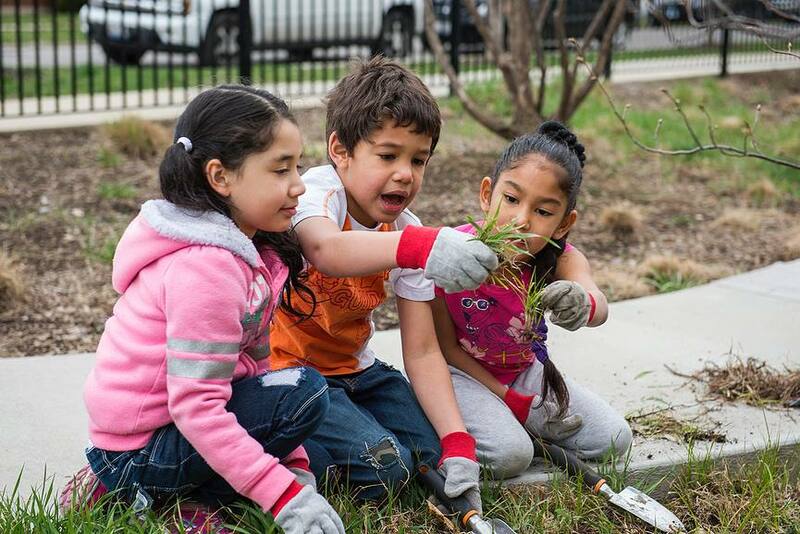 Space to Grow transforms Chicago schoolyards into beautiful and functional spaces to play, learn, garden and be outside. The schoolyards also use special design elements to help reduce neighborhood flooding. “A new schoolyard will provide us with wonderful opportunities for structured outdoor activities,” says Oken. One of the most unique aspects of Space to Grow is how the community is involved in every step of the process in order to create a schoolyard that meets many needs and serves as a source of neighborhood pride. 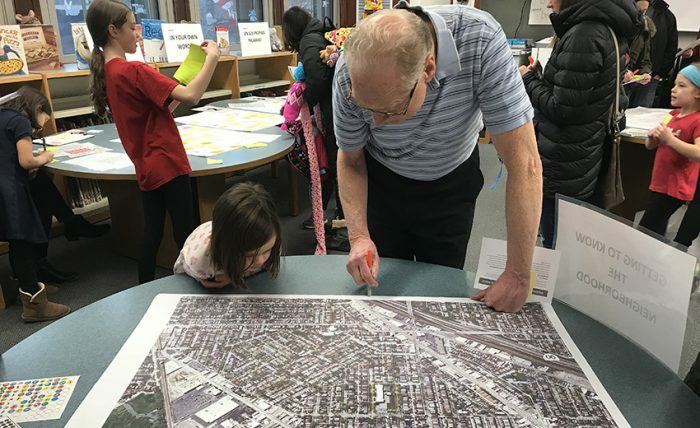 The first planning meeting at Farnsworth was held in January, where community members came together to share their ideas and desires for the new schoolyard. 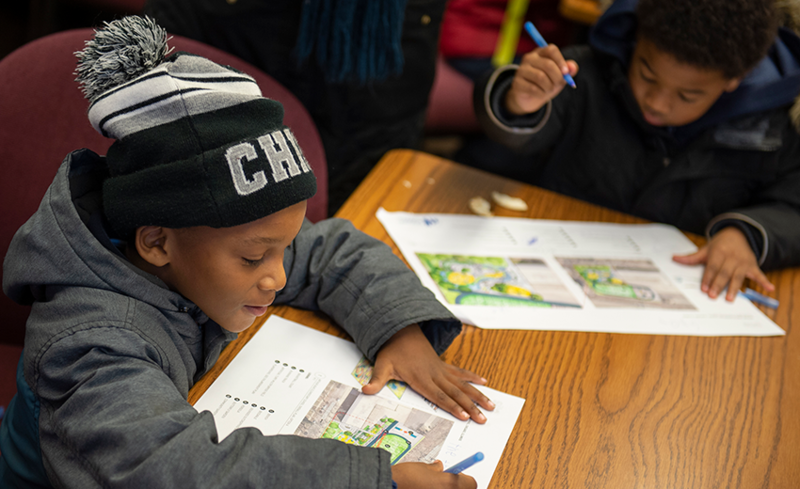 Attendees discussed the current schoolyard space, shared their ideas for the new schoolyard and helped Space to Grow staff get to know the neighborhood by highlighting local institutions and businesses. Parent Christina Hatley and her family have lived in the area for more than 13 years—and live directly across the street from Farnsworth. Both of her children attend Farnsworth, and she has been active in the school community for years, including serving on the Local School Council, co-chairing the book fair and being the vice president of the PTA. Christina is hoping to see improved, accessible playground equipment, more seating—especially in shady areas—and beautiful landscaping. “The kids and families of this community deserve a clean, fun, safe, accessible and modern place to gather that is within walking distance from their homes,” she says. Right now, the closest park is several blocks away and involves crossing two busy streets. Involving the community in the planning and incorporating their ideas helps foster their stewardship of the new schoolyard—something that’s not lost on Christina. “My hope is that because the community was able to give their input on the design, that it gives them a sense of ownership in the park and will help keep it safe and clean for everyone,” she says. Sign up to receive occasional updates from Space to Grow.